Oregon basketball enjoyed an electrifying season, one that it was never supposed to enjoy at all. After returning only three rotation players, the Ducks were expected to finish eighth in the Pac-12, all but certain to miss the NCAA tournament. 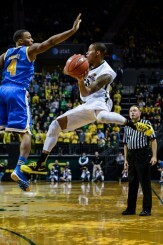 Joseph Young saw to it that the Ducks proved all their doubters wrong. Young led the Ducks to the Pac-12 Championship Game after his dagger of a three eliminated Utah, and went on to average 28.5 points per game in the Ducks’ two tournament games, helping the Ducks almost knock off No. 1 seed Wisconsin. In a year when the Ducks had nothing, Young was everything. Shooting Off the Dribble: Young is a great shooter in general, but the 6’3″ guard especially excels at shooting off the dribble. Just ask Utah about Young’s ability to create his own shot — the guy is a freak. Even with every single defense the Ducks faced keyed in on him, Young still managed to produce some of the best numbers in the nation. Young did see substantial dips in his numbers, with his shooting percentages dropping from 48% to 45%, and his three point numbers falling even more, from 42% to 36%. However, as previously mentioned, those numbers are his shooting averages even when he was doubled on the majority of his offensive touches. Young had little to no space to shoot in the 2014-15 season, so scouts should be encouraged when thinking about his ability to score against a man-to-man defense. Young looking for a tough pass. Court Vision: A shooting guard at heart, Young was forced to take on the role of the primary ball handler this season while Dana Altman developed the rest of his younger talent. 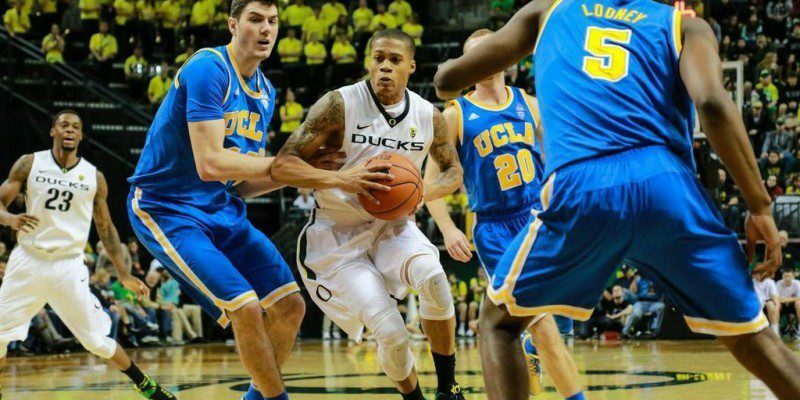 Young took the task head on, averaging nearly four assists per game for the Ducks. That number probably would’ve been higher had it not been for the Ducks’ inability to knock down open shots. His vision, paired with his scoring ability, will be useful if he decides to try to advertise himself as a point guard for NBA scouts. Intangibles: Whether he was firing up the crowd or mentoring other players, Joe Young was the ideal basketball player both on and off the court. He’s the kind of guy all NBA GMs want in their locker room, and his energy is infectious. Size: Currently, Young is still listed as a shooting guard. As mentioned above, he’s only 6’3″, and he’s not particularly bulky, either. With the ever increasing size of NBA players, Young will need to be able to elevate over taller defenders. The reality is, he will simply not be able to do so when matched up against guys three or four inches taller. Young would probably be an ideal combo guard in the NBA, someone who can come off the bench and provide a scoring spark while not being confined to one particular position. One of the many times where Young saw attention from two defenders. Tunnel Vision: Young is as good a scorer as they come, but he can be streaky at times. If he’s having an off night, he often struggles to recognize that and will take poor shots to try to get himself going. He will even miss wide open passes at times while trying to find himself a shot, something he’ll have to fix if he wants to see minutes in the NBA. Bottom Line: Young is one of the best scorers in the draft and will certainly be given a chance to prove he deserves an NBA contract. His size will worry a lot of scouts, but Young has never let his size stop him before. Look for Young to be taken anywhere after the middle of the second round.